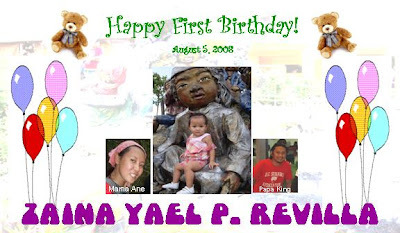 By August 5, 2008, Zaina will be celebrating her First Birthday, that is why I am quite busy these days. I went looking for venue, clowns/magicians, designed the lay out for her tarpulin (above photo), went out looking for guests tokens, and still preparing for the invitations and so with the balloons. I am halfway done with the preparations. I have now a venue, still doing with my personalized tokens, clown/magician is okay and others still puzzling. Hay, things are a little drowning but sure to finish before our special day. My birthday was not extravagant but sure I did enjoyed my day.. heheheh thanks to Badet Melody Anne and Mae. At the ofis we just prepared some SU-TU-KIL (Sinugba, Tinola, and Kinilaw) in English grilled fish, fish broth, and like japanese sashemi for kinilaw with sweet watermelon on the side. Hmm arent’t you starving yet, are you? On the afternoon, a heavy snacks of LOMI (noodles) and loaf bread. After office we headed SM Mall for our planned studio photo shot. Much fun striking pose with my so called office buddies. I will post the photos later. Then we ate at BANOKS for a chicken bar-b-que and pork sisig with their unlimited rice. On my way home, I bought some chocolate ice cream and some banana cake. That is how i celebrated my birthday!! hahhaha sound boring but its not. I enjoyed the day.